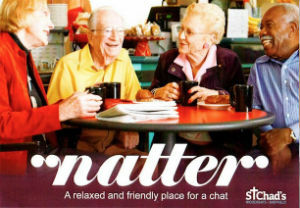 "Natter" is an informal drop-in morning for the over-50s that meets at St Chad's every Tuesday morning between 10.15am and 11.15am. A variety of hot drinks are served with cakes and biscuits, but most importantly Natter provides a listening ear and a willingness to chat. There are no speakers, board games, organised events, only friendly chatter over a good cuppa. Everyone is welcome and will be welcomed.